Below are listed things that could harm or endanger your pet lory. Some may seem too obvious or perhaps highly unlikely but each of these has been written from the sad experience of having a lory injured and tragicaly some have resulted in the lory's death. Flying into a window or clear glass in a door/ranch slider can be a problem with a lory that is taken indoors or allowed outside it's cage to fly around a room. Where there are clear glass windows then it is almost guaranteed that the bird will not realise there is glass and will attempt to fly out through the window. The resulting crash, at best, will stun and shock the bird, at worst will cause major injury, broken bones, skull fracture or instant death. So what can be done to minimise this impact risk? Some suggestions are: Cover up the windows, draw curtains, drop blinds, have dangly things in the window, stick on transfers, tape on newspapers, hang some clothing from a coat hanger in the window, etc.. the general idea is to let the bird know that the window does not mean clear flight space. Lories do not understand mirrors. It is often amusing to watch a lory display to it's reflection or think it has found a new buddy or companion. Occasionally a lory will react badly and attack the mirror image, most times this is not a problem but giving a mirror a sharp stab with a beak will stun and shock the lory if done hard enough and may even crack the beak or cause head/brain damage. A mirror on the wall of a room where the lory is allowed to fly for exercise can confuse the lory into thinking it is a doorway/opening into another space. The same dangers apply here as to a real window and the mirror should be covered up. Lories enjoy having a bath and will splash water all over the place with great delight. Often a daily bath is taken so bath water should be replaced often, more often the bath water doubles as the drinking water so cleanliness is very important. Some lories have been know to try bathing in their liquid food mix when there is just no water available! Keeping the bathwater clean should minimise problems when lories drink it. The main problem to watch out for is the possibility of the bird drowning in its bath. The issues here are: the depth of water in the batch, the ability of the lory to climb out of the bath, the bath water temperature and the material the bath container is constructed from. The combination of water depth and how well the lory can get out of the batch is the main issue. If the bath is made from plastic or metal which affords no natural grip for the lory's toes then a brick or rock should be placed somewhere in the bath. Have a perch running just above the batch or a rope/chain dangling into the bath at one side. A short length of cage wire folded over the edge of the batch and into the bathwater will make climbing out easy. A wet lory will not be able to fly. So thinking a lory can fly out of its bath is wrong thinking. If the lory has no method of climbing out then it is stuck. Water will very soon cool down it's body temperature and unless caught quickly the bird will die. Since lories will tend to want to bath when they see you filling the bath container with fresh water it may be an idea to use lukewarm water to allow the lory to recover more quickly, especially on a cold winter's day. In general these are not good for lories. Apart from the obvious hot cups of coffee, tea and other beverages, many of the 'designer' drinks such as sports drinks, vitamin drinks, energy drinks as well as all alcoholic beverages are definitley NOT to be fed to a lory. Alcohol is a killer, DO NOT let the inquisitive bird sample it. Although lories will experience alcohol in fermeting fruit it will be nowhere near the concentration found in alcoholic beverages. Chocolate drinks, chocolate sweets, chocolate cookies, and anything containing chocolate must be completey avoided. Chocolate contains an enzyme that can severaly sicken and kill a bird and although attracted by the added sugar in chocolate products the lory can easily consume enough to be fatal. Nearly all vegetables and fruit are ok to feed to a lory. One, however, must be avoided, this is avacado, this fruit is damaging to the lory's digestive system and will cause major problems. Although sugar based items, jams and spreads, are ok to give the lory in small quantities they should not be provided on a regular basis as lories can develop sugar-related problems such as diabetes. Better they derive the fruit sugar energy they need from fruit sugars (apples, pears etc..) or mixes made with honey as a component. These are very nasty and the lory will definitely suffer if exposed to either. Keep the lory well away from cigarette smoke, fumes and smoke from fireplaces, heating boilers, heaters - especially parafin types, washing, chemical cleaners, disinfectant and bleach fumes, petrol and oil fumes and exhausts from lawnmowers, garden tools, cars, bikes, paint and paint thinners, glues and adhesives, fly and other insecticide sprays and bombs etc.. 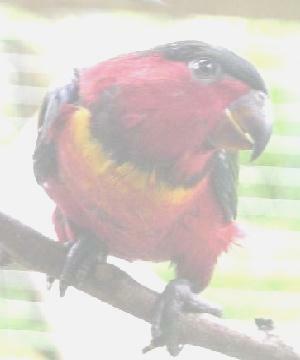 Some lory owners recommend not keeping a lory in an air-conditioned environment as this can quickly spread airborne bugs to the captive lory. Excessive heat and cold, excessive dryness or humidty, draughts, dampness and direct sunlight should also also be avoided unless there is a safe place for the lory to get away from these extremes. Toys that use ropes or chains that can twist up tighter or springs can trap a lory, causing distress and panic that could lead to more serious injury. Loose coiled multistrand rope or an open-link type chain or steel, wood, plastic and woven material springs can all create a situation where a lory can become trapped by a foot, toe or even by plumage. The lory will then panic and try to pull away from the toy, if it cannot easily escape then trying to fly can tighten the trapped limb and at worst could cause broken limbs or strangle the lory. Check out new toys thoroughly looking for ways or places that the lory could become trapped and either avoid toy or hang/mount it differently to minimise risks. These are pretty obvious things to look out for. There are plently of stories in bird magazines and on the internet about how birds were poisoned by ingesting metal so using some basic common sense should avoid or greatly minimise such poisoning risks. If a cage or aviary uses zinc coated (galvanised) wire netting or welded wire then this coating will need to be 'aged' before a bird comes into contct with it. When constructing an avairy the wire should be obtained several weeks beforehand and left out in the rain and sunshine. Alternately it can be scrubbed with a weak acid mixture using a vinegar/water mix. With new wire any 'flashings' of zinc needs to be removed using pliers and if needed a small file. Wire on aviaries should be inspected frequently and if the zinc is oxidising, shown by the presence of a white powder on the wire, then it should be scrubbed clean, again using a weak acid vinegar/water solution. The white zinc oxide powder may attract the lory and is easily licked off the wire. A good remedy for oxidising wire is to paint it with a non toxic paint such as roof paint. Painting a dark colour or black has the advantage of showing off the birds. Many stainless steel food/water containers are supplied with a chromed ring to hang the bowl or screw it to aviary wire. Often this chrome will rust through and may result in flaking pieces of chrome plating that the lory could ingest. Frequently inspect such items and even if rusting keep them well scrubbed and as clean as possible. Rust itself will generally be ignored by a lory but it still pays to remove it as much as possible. Do not be tempted to paint such items with metalised paint - most of which are zinc based. Avoid copper wire near or in an aviary, either bare wire or the plastic coated types for conducting electricity. A lory will have great fun stripping the plastic - and probably ingesting some of it as well! -then trying to chew the copper wire strands. Other metal items such as coins and jewellery usually do not present a problem but watch the lory cannot break off small items or parts from gold and silver jewellry and then swallow these - the same applies to precious stones! This may seem blatently obvious BUT lories need to be very closely supervised when in the company of ANY other animal including other birds. A pet lory quickly becomes a loved member of the family and if cats, dogs, mice, rats, rabbits, or other birds are also family pets then a lory, when free to fly around a room or outside it's cage on it's human either playing or resting, needs to be closely watched when in the near vicinity of any other pet. ALthough pet cats can appear be quite tolerant of a lory, the real fact of cats is that they naturally hunt, kill and sometimes consume birds. Lories are no exception. Take your eye off a cat near a lory for just a couple of seconds and you may not have a lory any longer. The cat is neither evil, a murderer or a no-reason-killer. It is only doing what is built into its genetic makeup. If any fault lies anywhere then it is with the human that allows cats and lories near each other. Dogs will not generally hunt a lory but their naturally excitable and sometimes boisterous nature means accidents can happen. If a lory is involved then serious injury or death could result for the lory, therefore dogs should be very closely supervised when near a curious lory. Pet rats and mice are usually no threat but they can cause a lory to panic and fly into something and maybe injure itself. On the other hand wild rats and mice can be a danger if they get into an outside aviary. Both rats and mice will destroy eggs and take baby lories. A rat will take an adult if the opportunity is present. Other birds, including other lories need to be watched closely when introduced to a lory. A newly introduced bird could cause jealousy resulting in a vicious attack on either of the birds, or on a nearby human, or panic and distress. Keep lories away from a tired human (including you!). It may seem cute to have a lory sleep on your shoulder or tuck itself under your hair or clothing and then go to sleep BUT the human must stay awake. If the human is tired and falls asleep then the lory is in real danger of being crushed and either seriously injured or killed. A friendly bird may approach or land on a child or strange human. Children should be very closely supervised near any animals, this applies to lories as well as larger animals. A child will not be aware of how fragile a bird is and can easily cause severe damage if it manages to grab or hold the bird. A human unfamiliar with birds could react adversely to a bird landing on their head or body, some may panic if they think they are being attacked in some way and this could lead to the bird being hit with a hand or object. If the bird is playing with a stranger then a nip or sharp claw could also result in a severe reaction again possibly resulting in the bird being damaged. You should always tell visitors how to react when in the company of your lory or else keep the lory away from them. Check around aviaries and cages for ant infestations - also weevils and colonies of other insects. Ants do not usually present a problem but a nestbox that has become infested will be avoided by the lory. If ants start to infest a nestbox where a hen is sitting on eggs then there is definite risk of the eggs being abandoned. Lories will naturally eat ants but over indulging will make them sick and the smell of crushed ants from the lory will be quite obvious. Check the lory's plumage from time to time for parasitic insects, these usually look like a cross between a small wasp and a mosquito and will be seen under the neck plumage where the bird cannot easily reach to preen it's feathers. Excessive scratching around the neck will be a sign there is something else living there. Treat with a small dose of insecticide spray usually sold for flea control on cats and dogs (such as Frontline) or visit your avian vet. The covered areas of aviaries are an excellent home for swarms of mosquitoes and these are capable of biting lories. A good spraying with a fly-killer spray should dispose of these horrors with a regular repeating every week or so to keep them away. Also make sure there are no nearby unattended water puddles or tins/pots containing water - these are where mosquitoes breed, even the smallest spoonful of water is sufficient. Spiders will naturally colonise the covered recesses of an aviary and are an excellent control for other insects (if you prefer not to use insect sprays), the main problem is that lories will often catch and squish spiders. Other insects such as preying mantis, moths and butterflies, flies and blowfiles generally present no problems. Occasionally a lory will catch and squish one of these and appear to enjoy consuming the juices !!! Gabby's necrospy showed that she died from a piece of a plant she ate. The vet said it had made a toxic bubble in her stomach. The plant was a Peace Lily. - Which I have read on many sights is ok to have around your birds. I knew that Gabby had climbed down off her cage, and shreaded some of the leaves off, she liked to tear up things/ But she was a finicky eater regarding green veggies. It was /is a very painfull lesson to learn. I have put all of my peace lillies out of my house. Please if you have any of these - do not let your birds get in them. All lory owners want to have a bright and healthy pet lory and most owners can quickly detect that change in outlook or behaviour that is not normal. Sick birds have a natural tendancy to try and look and behave as normal as possible so that by the time something unusual is noticed it may mean the bird has become quite ill.
Below are some suggestions and ideas gained from practical experience with lories over several years. By no means a complete list of potential problems it does cover some of the more obvious things to look for. Never be slow in deciding to get your sick bird to an avian vet. This point cannot be emphasised enough as waiting a day or two to see if the bird improves on its own is NOT recommended. When it is obvious the bird is ill an urgent appointment with an avian vet should be made. Sick birds can go downhill very quickly so urgent action is needed, get to that vet real quick! In meantime it is important to keep the bird warm and secure and avoid causing stress. It should be kept away from other birds and if possible placed in a temperature controlled cage - such as a hospital cage or when this is not available then keep inside in a warm room and away from draughts. If the bird appears dehydrated then try to get some electrolyte solution into it as soon as possible. Look into the Lory's eyes. These should be clear and bright and the eyelid fully open. Eye colour should be clear and distinct. This is one of the easiest ways to tell when a lory has a problem as even a slight dullness about the eyes or a tired look will indicate the lory is out of condition or has something more seriously wrong. Behavioural changes could be due to a health problem or because something has stressed the bird. Even the most simple changes in environment or the presence of something new can be upsetting and stressful. More serious stress causes such as attacks from other birds or animals whether or not causing physical injury can completely change the behaviour of a pet bird. If a distinct change in behaviour has occured and the bird appears to be in otherwise good physical health then try to determine what change has caused the bird to stress. Inspect the lory's beak closely. Look for signs of fungal growth (or any strange growths/cankers) around the outside or inside the beak. Do not be too concerned about what appears to be cracks in the beak as this is quite normal. Lories wear down their beaks and these continually grow. Also inspect around the vent area. This should be reasonably clean. If there is an overall mess, especially if poo looks yellow/brown and is messed around the vent area feather and maybe the upper tail area then this is not normal. It could again indicate a bacterial/fungus infection problem. Use warm water and a tissue to clean up the mess around the vent. Overall plumage inspection. Look at the state of all the feathers looking for anything strange. A few frayed and broken tail feathers is usually not a problem. An active bird in a cage or aviary will tend to get tail feathers a bit ragged. If more than one tail feather is missing and the aviary is shared with another bird or birds then there may be a bullying problem as tail feather pulling occurs. If there are bald or thin plumage areas then look at these carefully to see if the new feathers are growing normally. If new feathers look stunted or not growing straight then get a vert to look at the bird. It may have the worst viral disease for birds - Beak and Feather or PBFD. Often many birds will have a replacement feather or two growing and at moult time here can be many white feather sheaths showing. These will gradually crumble away as the new feather grows. If there is an area where several feathers are missing then within a few weeks the replacements should have grown. If not then there could be a problem. If the lory appears to be excessively scratching then have a look at the scratched area. There could be a skin problem, infection, cut/abrasion, insect bite or a parasite of some type present. Some relief can be given by applying aloevera to the affected area although a visit to the vet should be scheduled if the annoyance continues for more than a day. The neck, head and shoulders areas are where larger parasitic insects live and where the lory has most difficulty preening and grooming. An insect will be seen quickly moving in and out amongst the plumage. These tend to look something between a large mosquito and smallish wasp in appearance and can be easily controlled (as with most other bird parasite insects) with a small spray of an insecticide such as Frontline. Air sac mite is a killer of young birds although any bird can be infected with this mite. The most simple way to detect this mite is to get the bird close to your ear and listen. A repeating and distinct clicking sound can be heard. Treatment is quite easy and needs just a tiny amount of ivomec aplied to the skin at the back of the neck. This will be absorbed and will kill the mites. With small nestlings under days old the ivomec cannot be directly applied and is best placed in the nesting area so that the nestlings can come in contact with it. Observing the lory for a while will soon tell if its overall behaviour is normal. A lory that spends more time than usual sleeping or appears to tire quite quickly when other lories are still active will have a problem. A lack of energy can indicate something a lot more serious rather than simply a bird out of condition. If the energy issue persists then a vet vist will be necessary to establish what the problem is. Most owners are very familiar with the normal weight and temperature of their pet. Lift the lory and from this you should be able to feel if it seems either too cold or too warm. A cold lory will be slower than normal and generally look run down. Its amazing how just heating up a cold lory will revive it. Weight is not so easy to judge without scales and already knowing what the normal weight range is for your lory. Make a note of weight each time you visit the vet as they will usually weigh the bird on each visit. Feel around the bird for anything unusal, are any bones more prominent than usual, are there any lumps or bumps, bald patches, scrapes, scratches etc.. When sleeping on a perch a healthy lory will perch one one leg, the other will be tucked up into the body feathers. If two legs are in use then keep an eye on that lory as this may be the first sign of something wrong. If the lory is trying to sleep on the bottom of the cage or avaiary then something is definitely wrong. Lories will naturally want to sleep either in a nestbox or on high perch. What comes out of your lory? Note the colour and content of the poo that a lory produces. This should be generally clear with small dark green to black content. Since lories have a very short digestive system and mainly eat liquid they tend to poo quite often. This can also make them more likley to suffer infections when food is not absolutely fresh or has become infected from dirty food containers or by being poorly located so that it can be soiled with poo. Problems to look for are when poo is not clear but a creamy white to darker yellow/brown colour. This can indicate an infection, either bacterial or fungal and if not treated quickly can lead to more serious problems. An initial treament for such infections is 'Mycostatin' which applied orally will kill all bacteria and fungus growths. Since all good bacteria are also killed the lori will need these replaced. Including natural yoghurt with food for a few days will accomplish this . The most important advice to give when a lory is sick or distressed is to visit your avian vet. Unless the cause of the problem is easy to deal with and the bird recovers to normal quite quickly then the vet visit is essential if not critical. An ill bird can go downhill very very quickly and be a dead bird within a day or so of you noticing there is a problem. Make sure that the vet you arrange to visit is actually an avian vet as not all vets will be knowledgeable about birds and their problems. You can waste time visiting the wrong vet who may just refer you on to another avian vet. It is a good idea to get this avian vet information now, before you have a sick bird, contact your local bird clubs/societies for vet contact information. The local pet store may also be able to help. Refer to the Avian Vet list belowas there may be one listed in your area. Dr Maureen Forsyth, D.V.M., M.R.C.V.S. Tile Pattern: 10 week old Yellow-bibbed Lory. Last modified: 16 September 2002.